Thanks to everybody that joined us at our Thanksgiving Skate Party on Saturday, Nov. 26! Thanks to the generosity of AZ Ice Peoria, we were able to hold our fundraising event on Thanksgiving weekend at their great facility. If you haven’t been there, you should put it on your list as a place to go the next time you’re feeling the need for some skating speed. We had a bunch of cool Coyotes collectibles up for sale, the $5 table was a big hit! We had some real bargains on the table, signed pucks, lunchboxes, mini Zambonis, all sorts fo cool stuff. We’ll be doing the same thing at our upcoming events throughout the year, so you’ll have the chance to bid on some great signed bobbleheads, hockey cards, and many other Coyotes collectibles you NEED to add to your collection. As you can see from the pictures a couple of the Coyotes Paw Patrol ladies joined us! They were helping out with skating lessons besides taking time out of their holiday weekend to mingle with a bunch of hockey type people. We appreciate their help more than we can say. We were even lucky enough to be joined by the big dawg himself! Howler was everywhere, as usual, doing his Howler thing all over the ice. Last, but certainly not least, we had Ali Dean Smith from the Arizona Coyotes Foundation attending with a couple kids AND a giant check in hand! 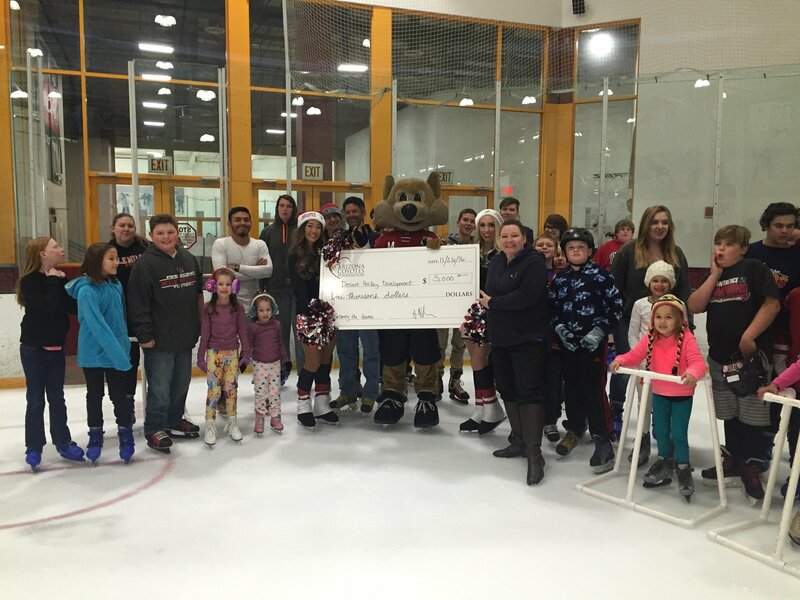 The Arizona Coyotes Foundation helped us get out show on the road last year with a generous grant, and they followed up AGAIN this year with more generous support. 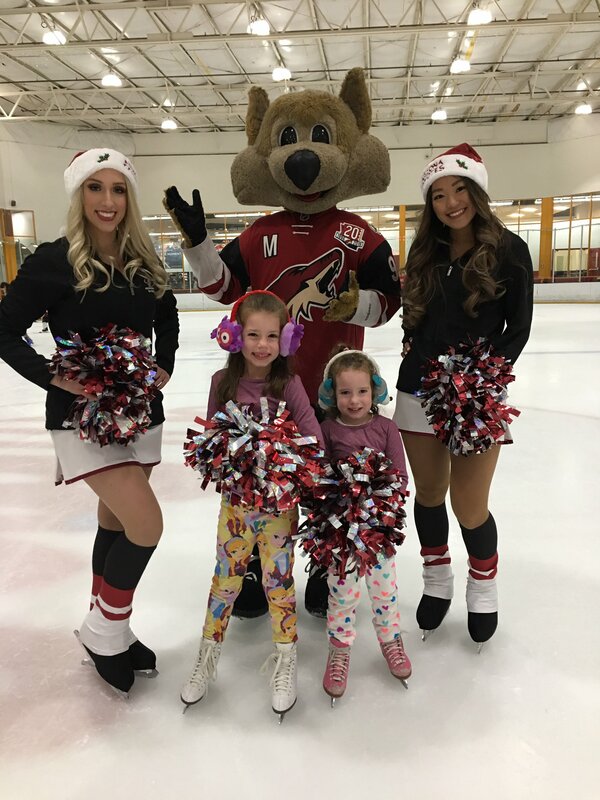 There’s no doubt the Coyotes are heavily involved with the local community just as Coyotes hockey is out somewhere in Arizona every day working hard to grow the game with youth hockey programs. We’re proud to be considered part of their pack. Fry's Community Rewards will donate a portion of your food shopping bill with no additional cost to you. Coyotes Youth Hockey Night – Deals! Desert Hockey Development is an Arizona incorporated nonprofit organization with full IRS 501(c)(3) status. All contributions are tax deductible up to your personal limits, please consult a tax specialist if you have questions. Registration fees for events are not tax deductible unless otherwise indicated.